Commitments to community participation are common in health policy, yet ways to maximise the input and impact of community representatives in health service delivery and care remain elusive, lack empirical evidence and are under-theorised. The role of Community Participation (CP) Coordinators involved in an Australian health service were examined in a triangulated multi-method, multi-site ethnographically informed three year study. Formal fieldwork involved observation of just over 42 hours of meetings together with informal interactions in the field with staff and community members and in-depth interviews and discussions with 10 Community Representatives, 19 staff and the seven CP Coordinators employed during the study period. Four key roles that Community Participation Coordinators undertake to support and facilitate the action of community representatives operating within a health service were identified in our analysis: 1) Building skills and confidence; 2) Engaging them in agendas for action: 3) Helping them navigate and understand the health system; and 4) Advocating to staff. A fifth role of advocating externally to outside groups and building coalitions is suggested as important, but was not strongly represented in our data. This study offers a new model synthesising the key roles of coordinating and facilitating community participation in health services which may be transferable to other health service settings. Our findings call attention to the need for health services to employ a facilitator who can support, engage, navigate and advocate for community representative’s participation and influence in health service policy and practice. While few people would argue against the principle of involving citizens in health system design and evaluation, in practice, the effectiveness of community participation has been questioned [1–4]. Most commonly recommendations to improve effectiveness of community participation have centered on training of community representativesa (CReps) to understand the health system’s operations, and changing staff attitudes and organisational cultures to be more receptive to them [4–11]. Organisational characteristics argued as important in any partnership between health services and communities include: valuing the knowledge of community members [11, 12]; facilitating access to information ; and developing staff skills in working with groups and in advocacy . The idea of staff having advocacy and group development skills is also supported by the few studies which have included some investigation of the role of a salaried facilitator for community participation in health services [4, 6]. A dedicated facilitator of community participation in health services has been identified as potentially important in improving engagement and influence of the community in service planning and delivery [4, 6, 10]. For instance, a salaried facilitator was argued as crucial to the influence of consumers in Cancer Partnership Projects in the United Kingdom for multiple reasons, including a key role in helping the group develop a shared vision based on “good interpersonal skills”. How the facilitator operated to support the consumers in their efforts was not elaborated . We found no further studies which expanded on such a facilitator role, in particular how they may operate to improve CRep skills and knowledge and to influence health services and staff to be more receptive to the input and action of CReps. Patient navigators, who support individual patients accessing health services, are widespread in the United States and Canada  and have relevance here. A synthesis of patient navigator literature in cancer care found some evidence they increased timeliness of screening and treatment and identified their roles in helping patients overcome health system barriers, providing health education, addressing patient barriers to cancer care, and providing psychosocial support . While the patient navigator role is more about supporting individual patients navigate the system as opposed to supporting CReps who are seeking to change the system more broadly, this literature provides a strong foundation for the value of a third party in health system navigation whether for individual care or advocacy for systems change. In the absence of health service specific literature that details the role of a facilitator at the systems level, we turned to the literature at the nexus of community development and health promotion. Here, a central role is often advocated for an ‘empowering professional’ in supporting community members working to achieve structural changes in society, and community participation in decision-making sits centre stage [15–18]. 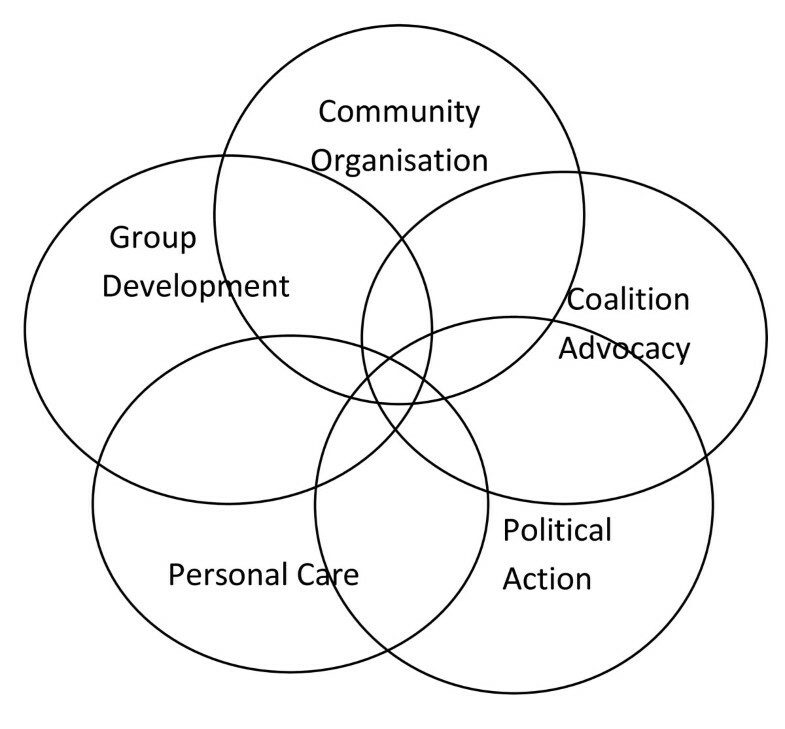 How health professionals can support and empower a collective of community members to organise and effect change within a health system is potentially similar to how they may operate in a broader community context. The community development and health promotion fields are deeply informed by broader theories such as the socio-ecological model and open systems theories that highlight the need for structural change to support individual behaviour change . The community development field makes strong claims for the role of a third party in facilitating community action. How this role is conceptualised by theorists and practitioners in these fields may inform understandings of the role of a facilitator of community participation in a health service context [15–18, 20]. In reviewing the community development literature we found no consistent overarching framework or theory that helps researchers or practitioners to understand the role of a third party in enabling community members to influence decision-making and social change . Despite strong claims for this third party role in community development practice [17, 18], we found a lack of empirical research which systematically examined the role in practice. However, in the community development and health promotion field, we identified a widely cited approach to conceptualising this third party role which has been informed by practice and was developed from six years of training workshops with more than 2,500 community health practitioners in Canada . This framework was considered potentially useful in understanding our study findings and is depicted in Figure 1. Labonte sees the Empowerment Holosphere as a way of viewing professional practice as part of a strategy for social change in health promotion and community development and focuses on the professional’s role in this change process. The Holosphere is depicted with five spheres, each representing a different level of social organisation and relationship between a health professional, their organisation and the community. They overlap as one sphere can merge into the next with progression from the individual (personal care) to societal level (political action) suggested. The Personal care sphere is focussed on personal empowerment of individuals and includes a professional dealing with individual needs and may align most closely with the Patient Navigator role . Group development, the next sphere, is where a group of individuals forge an identity and create a purpose or agenda for action which is argued to enable participation in more structured processes or action for social change. This ‘mutual support’ phase is also a central element of other community development frameworks [15, 18, 21]. Community members turning their attention to issues beyond their immediate concerns are seen to occur as the group develops an identity of its own. The next sphere of Community organisation is the process of organising individuals around an agreed issue or problem which may be different to that of the professional’s organisation. The spheres of Coalition building and Advocacy are linked as one usually requires the other. The role of a health professional here is in aiding community groups by offering knowledge, analytical skills and an understanding of how the system or bureaucracy works and helping them join forces with groups with shared goals. The last sphere of Political action is an extension of advocacy and is more about a social movement where the group has political legitimacy and voice in the public arena. In the field of health promotion and community development, the professional is often working outside the agency that employs them, in the spaces of community groups and organisations in this sphere [18, 22]. The case made for a third party in community development practice more broadly [15, 18, 21] and by Labonte specifically, predominantly focuses on what “the professional” should do to enable community organisation and action. How such a facilitator could operate in a health service setting, and what may restrain or facilitate action, is an important area of study. In health service settings involving the community and their ‘representatives’ is increasingly being supported, and an investigation of the role of a third party or facilitator in engaging the community in this context is timely [4, 23, 24]. This paper examines the role of Community Participation (CP) Coordinators in facilitating community participation in the context of an Australian health service. The focus here is not on the impact on the community participants themselves. Other research has tackled this, finding that participation can have positive, empowering effects at the individual level [25, 26]. Rather, this paper examines the kinds of actions and approaches taken by a staff member employed with the express purpose of coordinating, supporting and promoting participation, which may in turn facilitate the action and influence of CReps in a health service context. Data are drawn from an in-depth three year study of a Community Participation Program described elsewhere  involving multiple comparative case studies  in a large health district in Australia. Each case is one of eight Community Representative (CR) Networks operating at local hospitals in the health district. Two CR Networks and the hospitals in which they were located were focal points for data collection and were purposefully chosen as part of a larger study , and had well established CR Networks. The district has had community participation as a formal commitment since 2000 with an internally promulgated framework for community participation since 2004 . The framework details the aims, structures, resources and training for community participation in the district. The aims are to 1) involve consumers, carers and the community in planning, delivery and evaluation of services; 2) keep local communities well informed; and 3) ensure there is transparency and accountability in decision-making and evaluation. Build capacity and provide on-going support for a culture of customer service. The study was approved by University of New South Wales Human Research Ethics Committees (HREC 05081) and an Ethics Committee at the health service level (2006/012). The focus of the study was on understanding the meeting points and interactions between distinct cultures, the health service workplace and CReps as a group, and was informed by an ethnographic stance [30–32]. Prolonged field engagement allowed informal and formal encounters to be included as data in fieldnotes and audio-recordings . Sampling was purposeful with the choice of meetings and interview participants guided by the principles of seeking a diversity of views and meeting points, with emergent findings helping to direct further data collection [33, 34]. A summary of the data collected is provided in Table 1. The data included multiple methods such as interviews, group discussions and observation across multiple sites over time with different stakeholders. This mixed methods approach allowed comparison of what was said by different stakeholders with what was observed, increasing confidence in the key findings presented about the role of the CP Coordinator . In-depth, semi-structured interviews were undertaken with ten CReps across the district who were considered key informants for the eight CR Networks and for the two focal sites in particular. Staff members at the two focal sites and key district managers were also interviewed (n=19). Formal interviews were also undertaken with five of the seven appointed CP Coordinators (one CP Coordinator covered two CR Networks) including the CP Coordinator at focal Site 1 and the staff member at focal Site 2 who was taking on this role in addition to his role in Patient Liaison, as well as three CP Coordinators from other sites. All CP Coordinators also discussed their role as a group in a meeting attended at the end of the second year of data collection. Each individual interview was 1–2 hours in length and explored participants’ espoused views about the role, expertise and influence of CReps and also the role of the CP Coordinator. They were audio-taped with consent and transcribed. Data on enacted practice were collected via observations at a range of committees and meetings over three years up to 2010. The field researcher attended and recorded 10 health service meetings (10 hours 58 minutes) at the two focal hospital sites (such as clinical advisory and quality meetings), 11 Community Network Meetings (15 hours 17 minutes) at these same sites, five CRep Council Meetings (9 hours 12 minutes) and three CP Coordinator meetings (6 hours 55 minutes) at the district level as well as two end of year full day (7 hours each) district Community Participation Conferences in years two and three where all eight networks presented about their activities and achievements. This represented over 56 hours of formal ethnographic fieldwork in addition to interviews and time spent in the field over the three years interacting informally with staff and CReps. Fieldnotes were made during meetings, and conversations audiotaped with interactions and key events transcribed and then analysed . Observation at health service meetings were non-participant whereas observations at Community Network, CReps’ Council and CP Coordinator meetings became more participant observations over time with the researcher being seen as a colleague sharing reflections from the research and from her own past experience as a CRep . This approach was in keeping with an ethnographic stance where the researcher shifted between an Emic (insider) and Etic (outsider) perspective whilst in the field and during analysis . The sharing of reflections between the researcher and participants assisted in the analysis and in the services ongoing development of community participation. An iterative inductive approach to data analysis was taken. The analysis began in the first year of data collection with the critical role of the CP Coordinator highlighted early in the fieldwork. This finding guided subsequent data collection [33, 34, 37]. The data set was initially analysed thematically with constant comparison undertaken, that is, comparison of the views of different interviewees and comparison of what interviewees said with discussions and interactions which occurred in meetings [34, 37, 38]. NVIVO was used as a data management tool  with all data coded by the field researcher to nodes created and refined throughout the study. Further analysis for this paper focussed specifically on the node ‘Role of Coordinator’, which was coded to from all the data sets including Network Meetings at focal hospital Site 1 pre and post the appointment of a CP Coordinator. Site 2 did not have a dedicated CP Coordinator appointed during the study period. The CP Coordinator actions and roles articulated in interviews and observed during fieldwork were revisited and revised with constant movement between the different data sets and themes [34, 38]. Comparison of the roles from this inductive analysis were then undertaken with the Empowerment Holosphere, which was used as a theoretical frame to inform the discussion of our findings . In the presentation of our data, we will first illustrate the need for a CP Coordinator as a dominant theme in the community meetings attended early in the fieldwork. We will then turn to what happened after they were employed. Numbers are used to protect anonymity of the respondents yet also demonstrate the range of supporting data for our arguments. Salient observational data are captured from Site 1 where the discussions and actions of CReps can be examined pre and post appointment of a CP Coordinator. Actions of other Community Networks and their CP Coordinators, discussed in interviews, at district meetings and reported at the end of year Community Participation Conference, are also sources of data to illustrate the CP Coordinator role. The frustrations and impotence of CReps and their networks, operating without a CP Coordinator, were strongly reflected in early data collection. The problem of the employment of CP Coordinators was brought about by the amalgamation of health service areas into larger areas or districts just prior to the study which meant staff positions were lost, including CP Coordinators. The loss of CP Coordinators was acutely felt by many CReps as reflected in the following comments which were typical in early fieldwork. Community representatives are planning on handing in their resignations. As you know we started off with nearly two people for so many different projects, we represented community and now what do we do, we’ve got nothing (CRep 1, Site 1 Network Meeting, Year 1). Because we need a coordinator to actually recruit, sustain and you know do all these things to bring the group together (CRep2, Site 1 Network Meeting, Year 1). Advocacy by CReps for CP Coordinators to be appointed built over the following months with letters written and direct advocacy by long standing and well known CReps to service managers. By the end of the first year the battle to appoint CP Coordinators was reaping rewards “We’re having some wins” (CReps’ Council member) and by the end of year 2, there were four new dedicated CP Coordinators appointed including at Study Site 1. The analysis of interviews and observations following the appointment of CP Coordinators led to the identification of four key roles for CP Coordinators as illustrated in Figure 2, and elaborated with supporting data below. 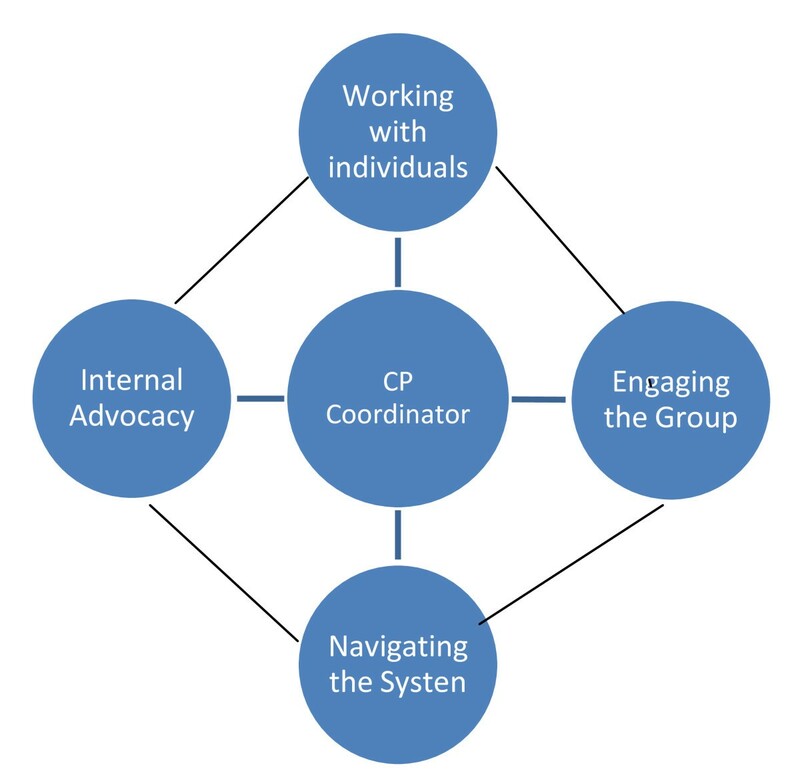 Four core CP Coordinator roles, that of working with individuals, engaging the group, navigating the system and advocacy, were identified during fieldwork. They are seen as inter-related and not necessarily occurring in a linear or ordered way. Each role could support the others, and entanglement of role behaviours was observed, illustrating the ongoing dynamics of CRep Networks and CP Coordinators support for individuals and the CR networks as a group. The connections between the roles are shown by the lines between the four spheres. People need time to be empowered, they need a sense of ‘we can do this’ and so that often it starts to shift if you start giving people a chance to actually perform and do well … It’s got to be kind of not actually be done for, but done with – and that’s sometimes just about done for, and then it’s done with and then it’s we’re doing (CP Coordinator 1, Interview). CP Coordinator 3: Did you get to Infection Control? How did you go? CRep1: Very very interesting yes [and then she went on to share her experience of the committee with the attentive focus of the CP Coordinator]. CP Coordinator 3: Are you still happy being part of that committee? Is it a productive committee? The value of just having someone to talk to was also a common theme among CReps when discussing the CP Coordinator role along with the mentoring and support CP Coordinators provided to individuals. The data revealed a prominent role for CP Coordinators in engaging the group of CReps, primarily at Network meetings, with each other, with health staff and in discrete and achievable projects that were of interest and concern to the CReps. This role was further highlighted by the differences observed in the operation of the Network meetings at Site 1 before and after the CP Coordinator was appointed. I think a coordinator brings the group together [Lots of agreement with all talking at once]. You need that coordinator to hold everything together (CRep2 Site 1 Network Meeting, Year 3). How can we work together as a group to mobilise this? How can we as a group share the knowledge and information that we have got together? I saw it more as a – my understanding of the network, like sharing information, looking at particular issues that we might be able to work together with (CP Coordinator 1, Interview). Well I dropped out because I got pissed off at somebody too. It’s taken a long time for me to turn around and come back. I’m back again because they said you were starting to move again (CRep3, Network Meeting Year 3). The tone and dynamic of the meetings is just so different. People are more animated, excited and focussed on issues that matter to them (Field Notes, Year 2). I think that they need to have wins so what I try to do is I have a huge horrible big plan, like transport, and then I have a small plan and so that we get a quick win and so we’re all interested and we stay engaged (CP Coordinator 2). I think it’s really important to get them actually involved in projects so they can see some of the results of their work, rather than, they sit on committees … (CP Coordinator 3). So at the next Network Meeting, I’m bringing the patient safety guy in, it’s a bit about letting the Reps know some of the things that we do within health, like in patient care. So I think it’s important to just build those connections, rather than always necessarily being on committees (CP Coordinator, Network Meeting, Site 1, Year 2). Staff 1: So I’ve told you some of the contemporary adventures in patient safety. CRep1: Well we’ve got so many questions and we’ve also got experiences. GM: How are you all? CRep1 : We’re having a very interesting discussion with [staff member’s name] he’s enlightening us. He’s explained some of the things we’ve had queries about. Staff 1: They dragged it out of me! [laughter around the table]. GM: Don’t let me interrupt that, just popping in to see how things are going. CRep 1: I’ve recently had a nice holiday here at your expense. [laughter]. We were just telling [staff member’s name] a few of our observations and how to improve the system. GM: Hope you wrote it all down [staff named followed by laughter around the table]. I feel there has got to be transparency and we don’t have that at the moment because we have no one representing us like the coordinator who can ask those questions and then they can pass it on to us (CRep9, Network Meeting Year 1). The following roles of navigating the system and advocacy are presented separately to illustrate their different emphases. In practice, they often occurred simultaneously. I met with the community members, we talked about what were the issues in the emergency department, we worked our way through the data, we actually identified key problems, we talked about how we would approach that (CP Coordinator1, Interview). They need those, you know, basic skills in critical analysis. The ability to reframe those kinds of questions but also do their own sort of exploratory process to reach … you know a position where they can actually make an informed decision (CP Coordinator 4, Interview). Examples of successful projects initiated and driven by CReps were the focus of presentations at the end of year Community Participation Conference in year 3. These projects were clearly facilitated by the CP Coordinator working with each of the Networks as the following excerpts from the end of year CP Conference illustrate. The CP Coordinator provided the understanding of how the bureaucracy worked and made sure the right people within the health service were consulted and involved to bring the CReps’ agenda into reality. The role of the CP Coordinator in helping CReps navigate and understand the system, gain approvals and follow the correct procedures was reported as critical to the success of a number of community-sponsored projects which were established during the study period. The CP Coordinator however often went beyond simply assisting in navigating the system by directly advocating to internal decision-makers in the health service hierarchy for the community agenda. And I think having the person standing at your door, reminding you and refreshing you that there’s a core responsibility that we’ve got … I think success is going to be very much driven, by the successes of the coordinators (Facility Manager, Site 1). I guess that’s part of my role – is about educating some of the staff that people are not just tokenistic (CP Coordinator 3, Interview). Being able to work outside the hospital to kind of get messages out there as well as working within the four walls … I think you’ve got to work both. Somehow you’ve got to balance the needs of both … you’re accountable to both but it’s not undoable (CP Manager, Interview). Work around Aboriginal liaising is a focus at the moment, having the Aboriginal liaison person out to look at the facility (CP Coordinator 2, Meeting, Year 2). The aim of this article was to identify and articulate key roles and actions of staff members whose purpose it is to support and promote participation of the community in health service decision-making. In our study the CP Coordinator role appeared central to CReps becoming a more cohesive group and pursuing their own community-focussed agenda over time in the health service sites where they were employed. The four core roles we identified for CP Coordinators were not discharged in any linear or hierarchical progression as suggested in Labonte’s Holosphere . Instead, these ways of acting in support of CReps were found to be utilised by CP Coordinators as needed to exploit opportunities as they presented themselves, for example facilitating the contribution of CReps at a Network Meeting at Site 1 to new developments in improving patient safety. At sites where a designated CP Coordinator was appointed in year 2 of the study, the CReps reported harnessing the relationships and knowledge of the Coordinator to achieve their own ends, as evidenced in the Cancer Garden and the Ward Grandparents Program examples. It may be the case that CReps can identify opportunities, but a CP Coordinator is important in navigating the rules and procedures of the health service and to advocate to key staff to effect change. Our findings and approach to understanding the role of CP Coordinators in facilitating participation provides a new model, and more detailed and nuanced insights into how such a facilitator of community participation may operate in a health service context than previous studies [4, 6, 10, 41]. Our data illustrate the role of the CP Coordinator assisting CReps to achieve their aims by working with the group opportunistically, engaging with staff and helping CReps navigate the health system, in essence, to exploit the diverse web of power relations [42, 43] in a health service to achieve the CReps’ agenda for change. The key roles of the CP Coordinator in the domains of engaging the group and navigating the system can be seen to align with Labonte’s group development and community organisation spheres of action . Here the CP Coordinator helps the group forge a collective identity and purpose and assists in organising them around common problems, in addition to promoting their participation in existing processes within the system. Previous studies in community participation in health services point to the importance of moving beyond group development to directly influence wider system decision-making, in short, to avoid consumers simply becoming a support group for each other [4, 6, 41]. Labonte goes further to argue that professionals working with community groups need to consider carefully what they are encouraging them to participate in – a bureaucratic, superficial process or a process where real change can occur . Our data reveal that the CReps at the health service studied did move beyond sharing experiences as a group in a potentially tokenistic and isolated process of exchange to making changes to practices, environments and policies of the health service with the support of the CP Coordinator. We also saw CP Coordinators actively questioning the kinds of projects and activities that CReps were encouraged to participate in and fostering projects where they could “see the results of their work”. Nonetheless questions remain about the extent of the role of the CP Coordinator, for example, as an advocate, and how their advocacy may be constrained within health service settings. The health service is continuing to examine the CP Coordinator role and how it can be enhanced. We have also published further work from the research which details the action and effects of CReps in the health services we studied, with and without the assistance of a CP Coordinator . The advocacy role of the CP Coordinator in our study was found to be focussed on helping the CReps navigate the system they are in, access resources and gain the right approvals to proceed with their activities. Advocacy and coalition building, including promoting CReps’ agendas to outside groups as conceptualised by Labonte’s Empowerment Holosphere, were actions largely absent in the data we collected. Coalitions are argued as central to the effectiveness of community action in the broader community development field [16, 18] and their potential utility to CP Coordinators working within a health service to achieve change should not be discounted. The ability of CP Coordinators to actively and overtly encourage coalitions with groups operating outside of the health service requires further investigation. Such external advocacy and coalition building is suggested as a possible strategy as soon as the group begins to engage in health service issues and develop their own priorities or agendas for action. It may be the case that the length of time that the CP Coordinator role was observed was not sufficient to see them move from internal relationship-building to the external realm. CP Coordinators did not express any frustrations about their mostly internal focus though they wanted to engage more with external groups and sometimes perceived their role as misunderstood and not always valued by other staff. Lack of understanding among staff may represent a challenge in the CP Coordinators’ quest to meet the agenda of the health service as well as pursuing community identified interests and projects, as a lack of staff support may be an obstacle to changes to policy and practice. A key role of the CP Coordinator in the framework studied is to work closely with staff as well as the community to improve knowledge and skills to work together and our findings suggest this should encompass promotion of their own role. The current lack of recognition of the CP Coordinator’s role among some health staff suggested by our findings could translate to a lack power for them in their own health organisation, restricting their ability to work with CReps on mostly smaller projects and to those within the confines of the health service. This study found four key roles for the CP Coordinator which facilitate the activities of CReps: providing support to individuals as representatives and advocates; engaging them as a group by providing knowledge of what is going on in the health service, supporting identification of issues for action and a response; helping CReps navigate the system to progress their own agendas; and advocating the value of community participation and CReps’ agendas within the heath service. The role of the CP Coordinator in external advocacy and coalition building is suggested as important, but was not evidenced during the time of the study. The actions and roles of CP Coordinators identified in this study contribute to knowledge about how a health service staff member employed to support and promote community participation can operate to enhance CReps’ engagement and contribution to improving health services for patients. Our analysis offers new understandings of a third party or facilitator role, working with the community in the specific setting of a health service, which may be transferable to other similar health service settings. The roles we identified build on and elaborate conceptual tools in community development practice and identify potential limitations of this facilitator role in the context of a health service. We recommend commitments to fostering meaningful community participation in health services should include the employment of a facilitator who can undertake the roles we found to be central to CReps’ engagement and participation in the study sites. Active recognition and encouragement of the facilitator roles we have identified are needed among health staff and managers if community participation in health services is to make lasting improvements to the patient experience. We would like to thank the health service staff and community representatives who participated in the study. SN designed the study, conducted all fieldwork and undertook primary analysis. All authors participated in the refinement of the qualitative data analysis and presentation in the paper. SN drafted the paper and JB and NS commented on drafts with SN leading the revision process. All authors have read, commented and approved the final manuscript. Consumer and Community Participation Framework. http://www.sswahs.nsw.gov.au/sswahs/community/pdf/CP_Framework.pdf.